story building. However, the fire had caused millions of dollars in damage and the smoke contamination was extensive throughout 10 floors of the building. Tenants of this building consisted of an accounting firm (during tax season), one of the largest law firms in the State of Arkansas, a very busy private restaurant, and many more. Business interruption for businesses such as these would be very costly had the owners and property management firm not reacted so quickly. Within hours Metro Disaster Specialists’ management team was at the scene to assess the damages and help minimize additional losses in the aftermath of the fire. This rapid response meant no time was wasted in the first few days following the disaster. By 9:00 AM, Supervisors and Emergency Service Crew Members were immediately dispatched to begin the restoration efforts left from this disaster. week. One of the first obstacles to be addressed was the smoke odor left hanging throughout the 24 story building. 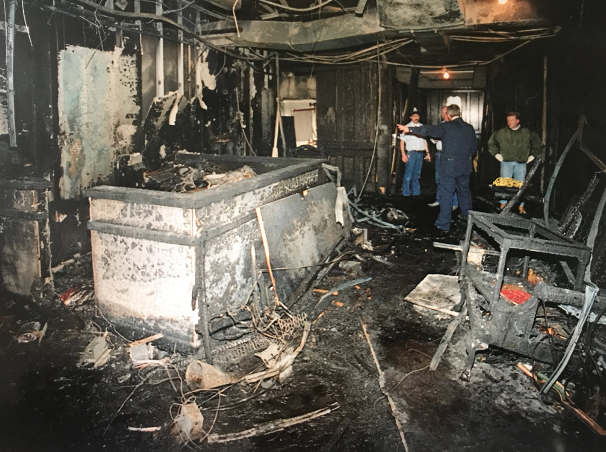 Although complete absence of the odor cannot occur until every inch of soot is removed, Metro had to obtain a safe, pleasant, and workable environment for the tenants and their clients during the restoration process. Within 48 hours, the odor was completely under control and the building was ready for operation. Virtually tens of thousands of documents were blackened by the soot. These were ledgers, legal, and other documents that in many cases could not be replaced or copied. Both sides of every piece of paper had to be sponged down by hand with special chemical sponges. Metro set up on-site crews to tackle the restoration of the papers that could not leave the premises and crews at the Metro plant to restore those papers that could be inventoried and cleaned off premises. Over 1500 boxes of paper alone were packed out from only one floor. It was vitally important that these tax documents be restored and return to the accounting firm with the tax season already in full swing. Within days, the firm’s top priority items were cleaned, deodorized and returned to their temporary office space. With priorities in line, Metro was able to return all documents within the required timeframes. Directly affected by the smoke of the fire was a large law firm consisting of 50 attorneys and another 52 member support staff. Fortunately structure damage to their lease space did not warrant immediate relocation. Therefore, Metro’s cleaning technicians worked around the staff as they were able to continue their normal daily tasks. The final detail cleaning of the HVAC, ceiling tile replacement, etc., required total rotation of the floors within the firm. With Metro’s expertise and a very cooperative client staff, this task was handled with much ease. Because the Bank, Property Management Company, and Insurance Companies involved had a plan; along with Metro on their team providing the work, disruption of operation was kept to a minimum. Be prepared — make a plan!